Photographed along Mesquite Wash, Maricopa Co., Arizona. May 17, 2008. The butterfly's larva feeds on the leaves, but the adult visits the flowers and could serve as long distance pollinators as they migrate. These beetles feed on pollen and nectar, but do not move much from plant to plant and would, therefore, not be very good pollinators. In addition these beetles lay their eggs in flowers and the larvae of the beetles can latch onto bees and parasitize the bee's nest. This is a male bee and probably has minimal potential to be a pollinator. It is awaiting the visit of a female bee. PERENNIAL : Robust herbaceous plant regrowing for two or more years from tap root. Plants two meters tall are not uncommon. Usually just one main stem with several inflorescences branching from summit. ARMED. The leaves are stiff and are set with long, sharp, spine-tipped marginal teeth. LEAVES: Leaves are sharply, pinnately divided and with most of the largest leaves - 50 cm plus in length - right at ground level. 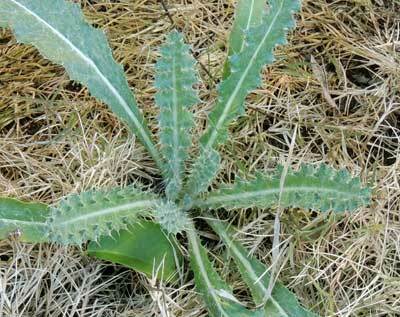 The leaves are hairy especially beneath and around the stem attachment. Before flowering all the leaves grow in a basal rosette, close to the gound where humidity is higher and temperatures moderated. RANGE: Frequent throughout the Sonoran Desert mostly at middle to upper elevations (above 800 m). Rocky slopes and high on wash banks; mesquite bosques and roadsides. Ranges from the Mojave Desert in California to parts of the Chihuahuan Desert in Texas and northern Mexico. 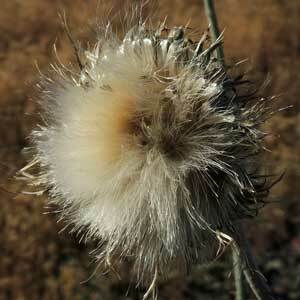 FRUIT: The seeds are topped with long, silky bristles making the flower heads attractive even in seed. FLOWERS: Hundreds of narrow florets comprise the composite head generating a cushion of gentle pink or lavender; occasionally almost white. The phyllaries (leafy bracts forming the base of the head) are also armed with spines and there is a lot of webby pubescence. Blooms mid spring in the Sonoran Desert, March to May. Silky bristles from the mature flower heads are taken by female Anna's Hummingbirds for lining their nests. 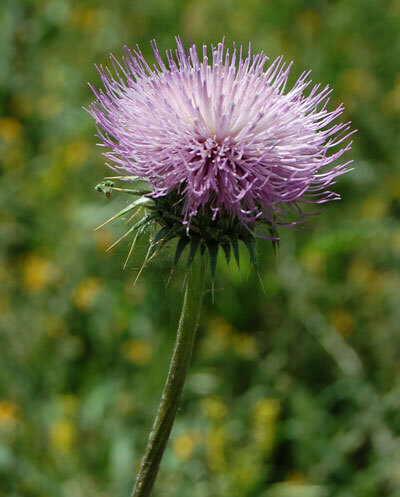 The flower heads are a favorite for many nectar-feeding beetles and butterflies. Some examples at lower left are thumb-linked. Leaves may be found sewn together into tent-like structures with a caterpillar inside. These belong to the Painted Lady (Vanessa cardui). 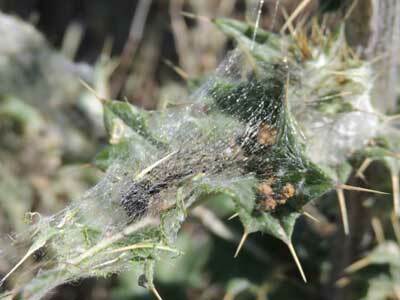 Hiding under a silken tent upon a thistle leaf is a larva (caterpillar) belonging to the Painted Lady butterfly. Near Humbolt Mountain in n. Maricopa Co., Arizona. April 2013.